100 Baht Royal Thai Survey new spelling Thai Government and have small text Royal Thai Survey both front and back. In 1936 Prince Ananda Mahidol ascended the throne to become the eight monarch of the Chakri Dynasty with the title King Rama 8. 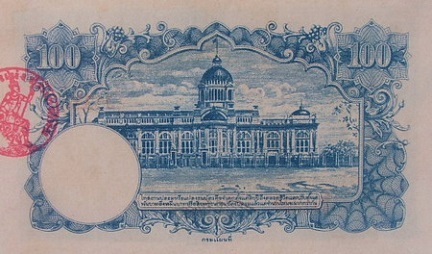 Early in the reign of King Rama 8, banknotes, 3rd series continued in use for some time. When they were about to run out, the new series banknotes were ordered to print by Thomas de la Rue for 5 denominations; 1, 5, 10, 20 and 1000 Baht banknotes. 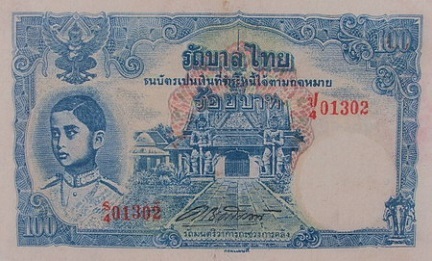 Then 1938, 1 Baht banknotes were the first issued. The security features of the banknotes are red and blue color silk fibers on banknotes and image of constitution on pesdestal tray watermark. In 1939 the country name was change from "Siam" to "Thailand" to reflect the fact that most Thai people are Thai race. The type 2 banknotes frome Thomas de la Rue also changed the country name. The World War 2 emerged in Europe in 1941 but not affected to Thai local way of life in early stage. Until Japanese troops launched violent attack on Perl Harbor in Pacific on December 7th, 1941 and invaded Thailand through the eastern seaboard in southern Thailand on the next day. Thai government had to comply the Japanese troops to enter into neighbor countries and was forced to declare the war against the Allies. Thai government established the Bank of Thailand according to the Japan requisition to protect the financial stability. Japan proposed to change the exchange rate at 100 Yen to 100 Baht. All Japanese transactions in Thai would be done in Thai Baht but returning transaction from Thai to Japan had to be done in Yen or gold. The demand of local currency was hike and Thai government could not order the new notes from Thomas de la Rue, the opposite country base company. Thai government requested the Japanese government to print banknotes and got good responses. Thai government also decided to locally print banknotes even lack of experience. The Royal Thai Survey Department was assigned to print banknotes on the local paper that produced by Thai Paper Mill at Kanjanaburi province. The Japanese sugar-cane fibers were supported at first that made the bright white paper. But used the local bamboo and rice cane fibers after the imported sugar can fibers ran out so that the paper were off-white. The security color fibers were also embedded in banknotes. Those fibers made of wool blankets which had been given to Western prisoners of war. The shredded fibers were dyed in red and blue colors then vertically scattered onto the middle banknote alignment through the metal pipe in wet paper process. The scattering quality sometimes was low and the fibers were stick together and some adhered to the printing plate that caused defects. Then the mixing color and paper fibers were used to solve the problem. The image watermark was made in initial. The rolling metallic molds of constitution on the pedestal tray watermark were pressed on wet paper process. Then the wavy lines watermarks were adapted because of the fast and convenient so the paper could be print for any denominations without concerning about watermark alignment. The new simplified Thai spelling was promoted in 1949 because the Japanese officers complaint that Thai language was hard to learn and they proposed Japanese language to be official language in Thailand. Thai government solve the problem by modified the rule of spelling and decrease number of alphabets. This language reformation had been used for 2 years and truned back to used the original spelling since the war ended. The 4th series 100 Baht Royal Thai Survey banknotes were announced on 27th Febrauary 1944. The main object is the image of King Rama 8 on the left. The middle image is the Crown-Top Gate at the Temple of Dawn. The serial code and number were printed with red ink.